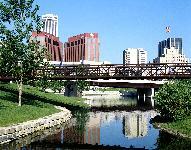 Omaha is a dynamic metropolitan area of 700,000 people. Down the street from Omaha's city center lies the historic Old Market. The one-time warehouse district has become the center of fine shopping and dining. Shops line the rustic brick streets selling everything from antiques to ziti. You don't have to be a Cornhusker fan to have fun around here. Home to the NCAA College World Series for over 50 years, Omaha takes baseball fans from all over the country out to the ball game every year. And if you love the great outdoors, you won't have to look far. With one of the nation's newest and largest network of scenic bike and hiking trails, well-stocked fishing lakes, and many wonderful natural attractions like the Fontenelle Forest Nature Center on the banks of the Missouri River, the air doesn't get any fresher. Year after year, national publications note the high quality of life Omahans and Nebraskans enjoy. Omaha is consistently rated in the top 20 percent of the best places to live by Places Rated Almanac. In 1999, Nebraska was cited as the sixth most livable state in the nation by Morgan Quitno.